I really like watching Bones. I think it’s a great show, and I love the cast. Temperance “Bones” Brennan is hilarious, and I love her personal sense of style. The weird chunky necklaces, the bold understated colors… the people who pick out her clothes are doing a great job if you ask me. So I thought to myself, “what kind of knit socks would Bones wear?” It had to be something simple, elegant, and understated. Something that a man or a woman could wear, something that could be dressed up or dressed down. Which, quite frankly, was a tall order. 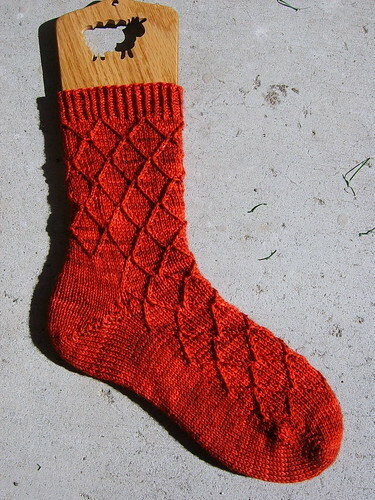 But I think I succeeded in my quest to design the perfect socks for Temperance. A lattice pattern composed of right and left twists, this sophisticated sock pattern may suit both men and women. 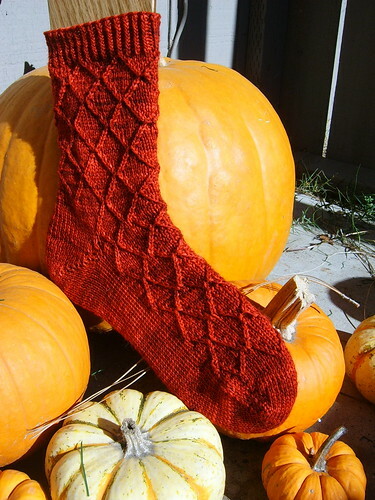 With a pattern repeat of only 10 stitches, this sock is easily sized up or down. 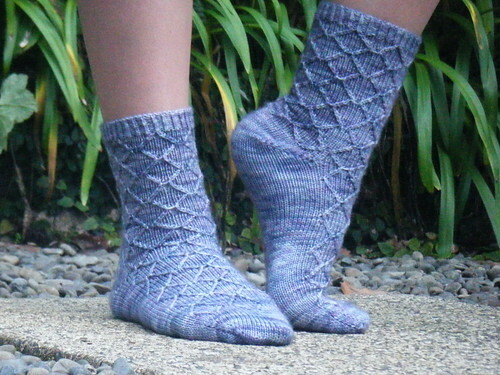 Although instructions are provided for a toe-up sock, the lattice pattern is reversible and can easily be switched to create a cuff-down version. There are two PDF downloads available. The first is the pattern in its entirety, and the second contains modifications for those wishing to knit the medium size. I have kept them separate because the instructions for the medium size would have muddled up the pattern and made it difficult to read – at least, in my opinion. The pattern includes 2 sizes, with unstretched circumferences of 7.20″, 9.20″ (S, L). Additional modifications to knit a Medium size (8.20”) are available as well. Instructions are charted and written out.